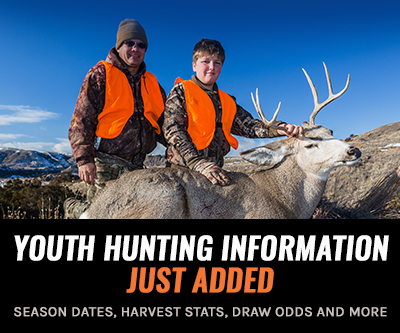 members, the goHUNT team is doing our December giveaway a little different again this year. This month we are bringing back The 12 Days of INSIDER. Each day we have a new series of giveaways and each day the number of giveaway items increases. There will be 78 winners in December with a total value of $21,000 in gear being dished out! There’s no better time to win an early Christmas present from us for being an INSIDER member. Must be an INSIDER to win. The earlier you join, the more chances you have to win. Below you’ll find the giveaway schedule and number of items we are giving away. 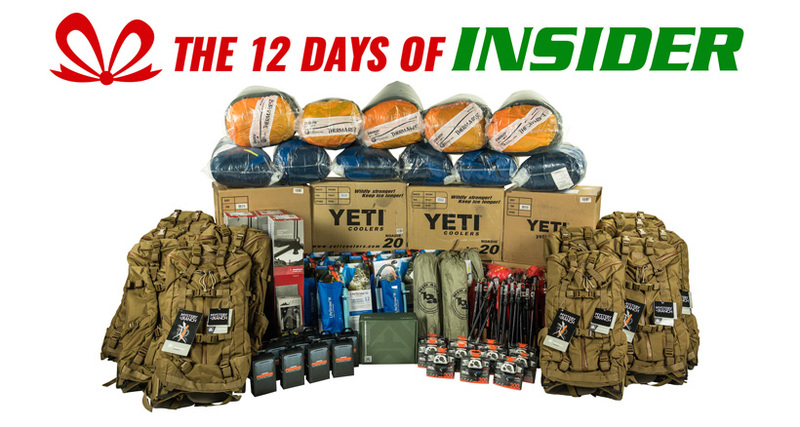 Congratulations to the winners of The 12 Days Of INSIDER giveaway! You will receive an email from us shortly. We hope you enjoy your new gear! Awesome gift from the GoHunt team! I’ll definately be putting the petzl headlamp to use! Not only does the service y’all provide stand apart from anything else out there but you’re great to your customers as well! Really appreciate everything! You woukdnt happen to be a former Army guy would,you ? Wow! What an amazing surprise! Feel so lucky to have won! Stoked! tenth time's a charm! thanks GoHunt! Won on day 9 and had actually been looking into getting some trekking poles for next year. Thanks GoHunt you made it pretty easy on me. What an awesome gift! And it showed up before Christmas! What an awesome gift from GoHunt! Love this cooler and it will definitely be useful for hunting and fishing trips! Awesome to get an additional gift for under the Christmas tree!!! Just found out I won the petzl light, can't wait to try it. Blessings abound! I just recieved notice of winning one of the packs. I am so grateful for this. Thank you for this!!! I will always remember this while pursuing my moments, and helping others on the mountain. So awesome! Just won the Mystery Ranch pack. Thank you guys so much! Holy cow, this is awesome! Thank you to GoHunt for providing the service I’ve been looking for. Hopefully I will have more surprises come tag season. Thank you again. Found out I was a 12th day winner!!! So pumped and excited, thank you GoHunt!!! for a second I thought I won close but not close enough just like my draws this year ! Congrats to David A; us floridians never seem to make the board. I never thought I would win something but I guess it was my lucky day. Maybe I better put in for a sheep tag this year :) Thanks gohunt. I love the service and the giveaway is a great added bonus. Keep up the good work. Merry Christmas! Fingers crossed!!!! This is one of the perks I look forward to every year. Ho-ho-holding out for the Mystery Ranch pack! Sure would look good under the Xmas tree, stuffed with goodies, like elk an' moose an' deer an' antelope! But no reindeer! That would be sick and wrong! Thanks for the trekking poles! Hopefully they will be taking the weight of some moose meat next fall! Thanks gohunt! I will be using the new trekking poles on an Idaho elk hunt this year. Can't wait. Merry Christmas! Excited to try out the Thermarest bag! Merry Christmas GoHunt team and thanks!! Gohunt is great. Keep it up. Hopefully someone from Florida wins something. Very cool! I need all this stuff! Just wondering how many people are actually in the drawing? Congrats to all! Dang! I saw Tyrel on day 6 and got excited for a split second thought I won. Congrats to all the winners. What are the odds of two Tyrel’s winning lol. I agree with Justin O. 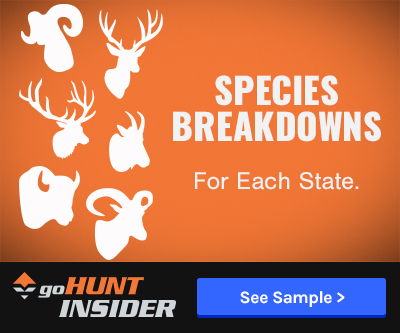 Go Hunt is second to done. very easy for me to recommend it. To be a winner is Gravy on the mash potatoes. Thank You Go Hunt staff for your service. I am so Happy I won a new Yeti Cooler! Thank you GO Hunt! I don’t need a gift from GoHUNT to appreciate the value of this service nor to recommend to all my friends. This is just a cherry on top! Thanks a ton goHUNT. More importantly, keep up the great work. Im in the same boat as most. I never win anything from drawings yet I always enter, haha. Great prizes. Congrats to all the winners! Great Looking Prizes, congrats to winners !! Wow!! Can't believe I actually won!! Thanks goHunt! Thanks goHunt! I'd all but given up to ever see my name on the list of winners. A co-worker emailed me and told me I made the list today! Thanks for all you do and giving back to members! I watch for my name to appear in the monthly giveaways and just said the other day my name will never get drawn. Well I guess I was wrong. Thanks Gohunt!! I can’t believe I won. Super stoked for this bag. Thanks gohunt for the awesome giveaways and everything you do for us hunters! Congrats to the other winners thus far as well. Brandon-I can’t believe I won either, and thank you! Haha I was just reading what Kyle K. Said two days ago when he thought he won. Then the son of a gun ended up winning today! Congratulations man! Congrats to the winners so far. Maybe, just maybe, my name will eventually be drawn. Super stoked to receive my new bag!!!!! Thanks GoHuny!!! Just in time for the cold weather too! Congrats to all the winners. I’m definitely keeping my fingers crossed on this giveaway list, especially for one those mystery ranch packs. Dang, another Travis S.... Congrats! Merry Christmas to me! New sleeping bag headed my way. 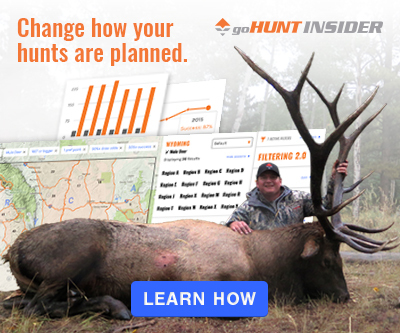 I signed up for the insider because it made searching for hunts so much easier. The point system and these giveaways have been the icing on the cake. All I can say is, it pays to be an insider. Thanks Guys. Just got word I won a sleeping bag! Couldn’t believe it- I never win any of these type of contests or giveaways. Thanks Gohunt for the great content and for making my day! @Brett - Glad you enjoyed that hunt film series with the BRO crew! I had a blast on that hunt and learned so much from their style. And... Colorado is very high up on my favorite places of all time... so I'd love to see some Colorado winners in this giveaway too! I'm actually surprised we haven't gotten any CO winners yet. Best of luck on the rest of the giveaways. We have a lot of awesome gear items coming up. Could we have some Colorado love please Brady? Nice work with BRO btw. Dang it. Saw Chris B and my heart jumped, but it was another Xhris B. Congrats to the winners. Good on them! Hunting gear is the best. Ohhhh man! I totally thought I won! Kyle K in Katy,TX....I wonder if he has the same last name! Congrats either way. somebody in the right city/state won, just got the name wrong. Oh well, 9 more to go. Just got my email about winning the Rugged Ridge Bipod. I can't believe I won and the cool part is being an insider is free and they do great giveaways all the time. Thanks go hunt, this is a great Christmas present. Congrats, all winners , and awesome job gohunt team it’s good to see good things done in a positive way!! Keep up the great work!! Merry Christmas to all!!! Congrats to Peter C. Nice to someone close by be a winner! Ahhhh I live in Canby!!! There goes my shot. Congrats Rob lol. Congrats Rob! Jealous is and understatement. Thank you for caring about us in the field. Way to go Rob. Congratulations Rob D. So, it's my turn tomorrow right? Congrats Rob. I own Razor HDs, you’ll love them. They’re great glass. I took a chance on the membership for the prizes....but damn, I'm learning the app. There is TONS of great info in there. Especially since I'm doing my first out of state hunt. Thanks GOHUNT!!! Membership appears worth it. Good stuff. Happy Holidays! Sure hope I win. Great lineup. Thanks Go Hunt team. Gotta love the 12 days of Go Hunt!! Great Prizes as always, thanks Go Hunt! Good luck to everyone and thanks goHUNT! Good Luck to everyone and have a Merry Christmas and Happy New Year. Great prizes this year. Thanks again for doing this. Thanks for taking part in the season of giving in such a big way. You guys are great! Great prizes above! Thank you for the opportunity!! Awesome giveaway guys! The information included with this membership is well worth the money as it is but the giveaways are an awesome bonus! Fingers crossed! How many members are there? What are the odds of winning? Those are nice prizes. I would be happy with a bugle tube and a couple of reeds. The membership is a gift for my son for Christmas - how cool would it be to also give him a winning prize to go along with it? Fingers crossed!! Let's see if I can win 2 years in a row!! I wait for this giveaway every year! It’s worth the price of the membership on its own! I could sure use that Manfrotto tripod! Any of those would be a nice Christmas present!